Hi! We’re back! 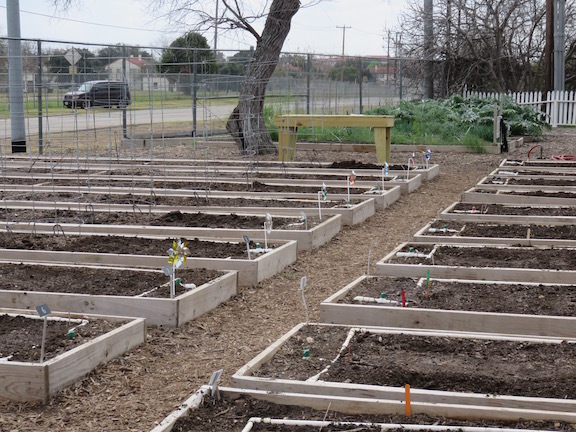 Last weekend was the first Saturday of the Spring 2016 Children’s Vegetable Garden at the San Antonio Botanical Garden. The first day is always special, seeing return gardeners and volunteers and meeting new ones. I’ll be chatting with you here about our activities throughout our spring program which lasts until June 4. Like last year, I will cover highlights of our day and useful information, and a detailed agenda on exactly what we did will be published here on this blog separately. That agenda has GREAT info, and I recommend you read it as well. This year we relocated our tomato cages and cucumber trellises to different areas of the plot, to do some crop rotation. It’s important to do this periodically so soil-borne plant diseases are not passed to the same kind of plant the next season. It also helps with soil nutrition to have plants with different nutritional requirements follow each other in the same spot. How frequently should you rotate at home? 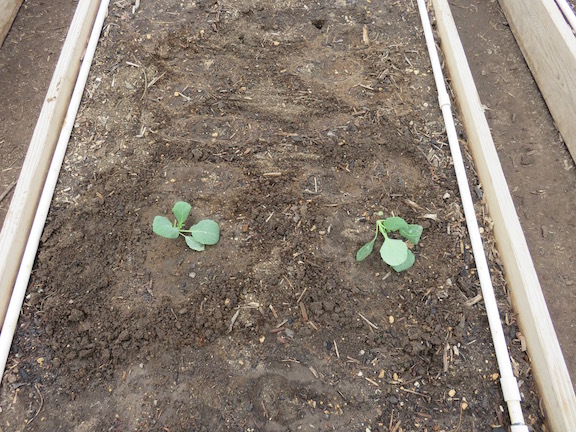 There are different opinions, but one I plan on doing at home is a 3 year crop rotation. So, for example, I will wait 3 years before I plant a tomato in the same space. 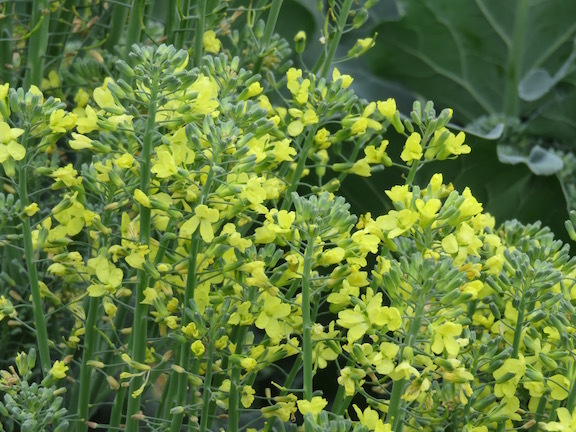 Here is a short and useful article on crop rotation from the University of Wisconsin-Extension. Before we planted, we fertilized the areas we were going to plant, as well as future areas, with Espoma Garden-Tone. When we do this, we only lightly scratch the area we have put the fertilizer in with a bow rake or hand cultivator. I should mention at this point that we try to disturb the soil as little as possible…we dig where we need to plant, but we don’t till or dig a larger area than we need to. This lets up loosen up the soil where we need to, but minimizes uncovering weed seeds that, exposed to light, may start to germinate. Less weeding is always good, right? 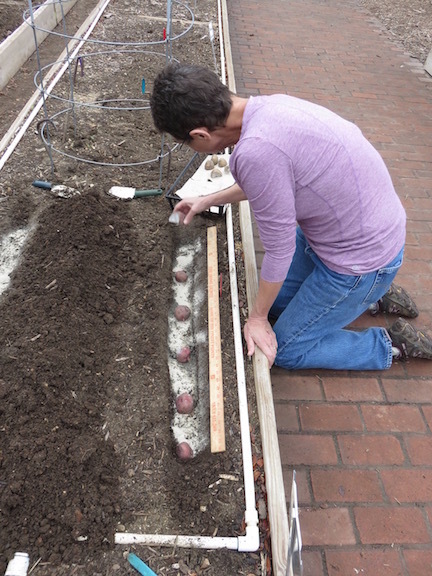 Today we planted white ‘Kennebec’ and red ‘La Soda’ potato pieces, and ‘Cheers’ cabbage transplants. You can see the eyes growing (look for the sprouts) in the photo above. The gardeners carefully dug their trenches (there was great teamwork going going on throughout the garden! ), one for the white and one for the red potatoes. 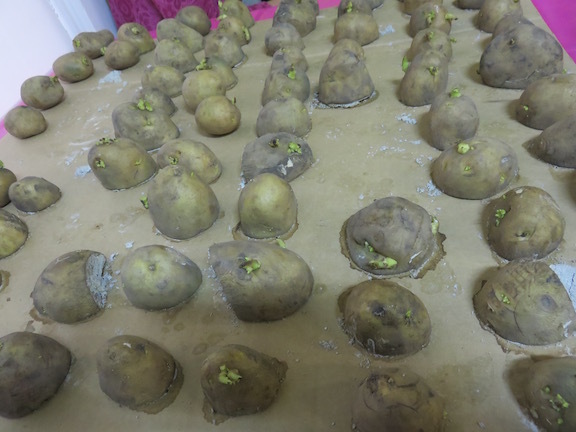 The potatoes were carefully placed with the cut side down, spaced evenly apart. 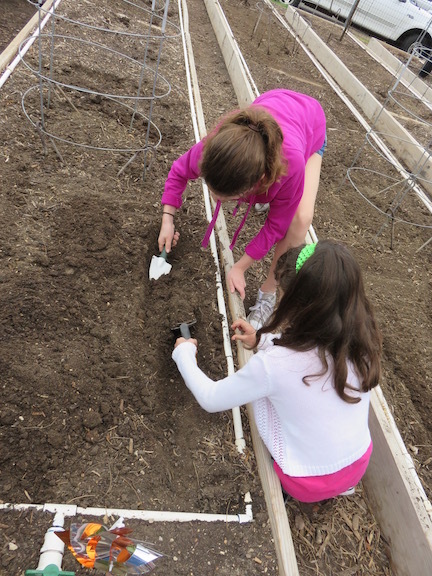 Throughout the day, there were team discussions with parents and young gardeners to go over what we were doing and why. Here’s our section listening to Sandra discuss our plantings. We wrapped up our day by fertilizing the cabbage transplants with HastaGrow, being careful to target the soil around the plants and not the leaves. Why not the potatoes too? They don’t have any roots yet. Know what they are? Yep, broccoli heads that had flowered. There are experimental beds at the CVG, and some of them are used to collect seed. 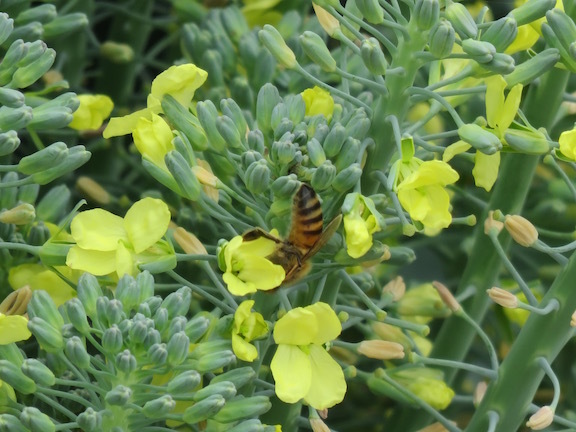 Another bonus of the flowering plants is providing food for, and attracting, our favorite daytime pollinator, bees. Go bees!